Poison sumac is a perennial plant that prefers wet soil. It often grows near rivers or shorelines. The poison sumac plant will look like a bush or a small tree, but you can recognize it by its number of oval-shaped leaves. Each stem contains between seven and 13 leaves. Poison sumac contains urushiol, which causes human skin to break out in a rash. If you find a poison sumac plant on your property, you will want to dispose of it correctly. Kill the poison sumac by spraying its leaves with an herbicide that contains the ingredient glyphosate. Follow the directions on the label, and do not let the herbicide come in contact with nonhazardous plants. Dig up the roots of the poison sumac plant with a shovel. Place the roots in a trash bag and tie it shut. Throw the trash bag out with your regular trash. The Food and Drug Administration recommends that you check with your local municipality first on how it prefers that you throw away the poison sumac. You may need to chop up the roots into small pieces, or use special trash bags. Wash your shovel when you have finished, using a detergent that specifies it is good for removing grease. The poisonous oil could be on the shovel, so washing it will prevent you from accidentally touching it later on and getting a rash. The poison sumac plant is poisonous all year long. You do not need to wait until winter to get rid of this plant. When removing poison sumac, protect yourself by wearing a long-sleeve shirt and long pants, and cover your hands with gloves. You should also wear a pair of boots. 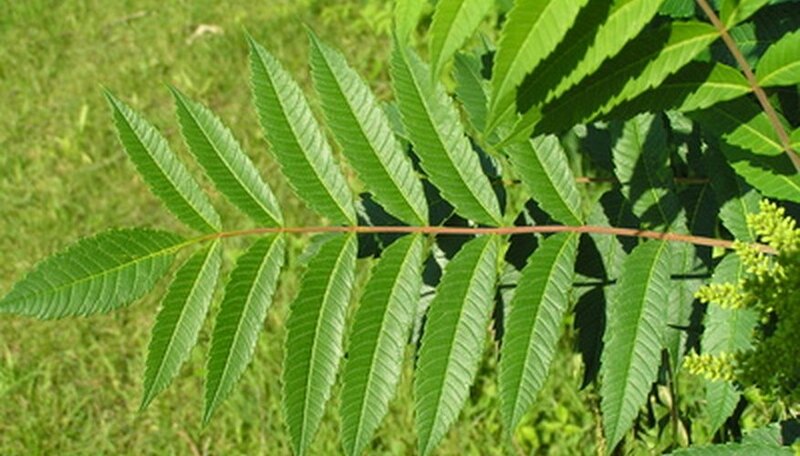 Wash your clothing in hot water and laundry detergent as soon as you have finished disposing of the poison sumac. Never try to dispose of your poison sumac plant by burning it. That will release the urushiol into the air.